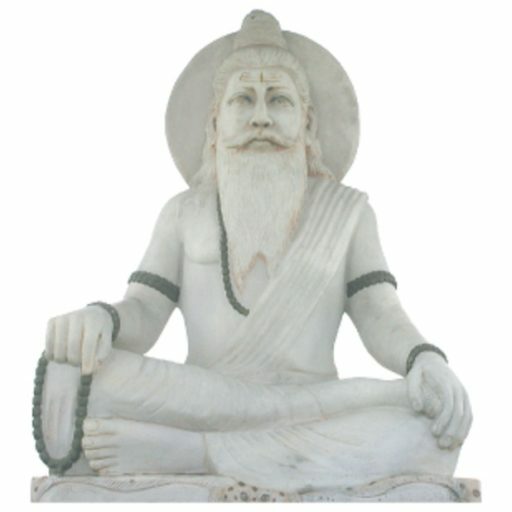 Vedic Astrology Bookshelfis a very unique tool which allows the user to explore the classical Vedic Astrology scriptures in a relaxed and efficient way. Create an interpretive report by compiling the applicable yogas and quotes from 16 classical texts. Create reports containing only the positive yogas and quotes for your sensitive friends/clients. Show the full text of each of 16 books, accessed by the book and chapter title. Search words: list all the text references containing a specified word in a split second. Search for all the text references containing combinations of words. Combine the text references collected from the yogas, index and searches and allow the user to edit the collection before printing. 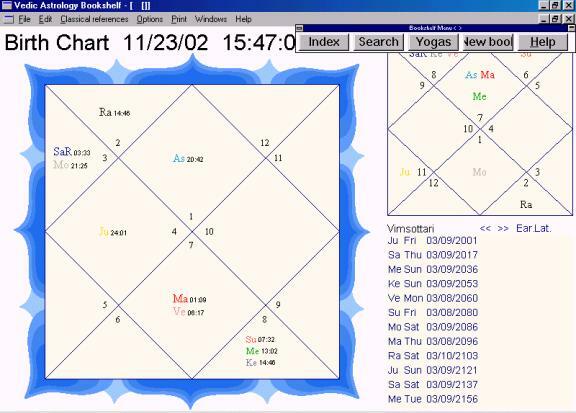 Calculate and print the birth chart, navamsha and dashas. Every serious student of Vedic Astrology is aware of the profound value of the authentic knowledge offered in the classical Jyotish texts. 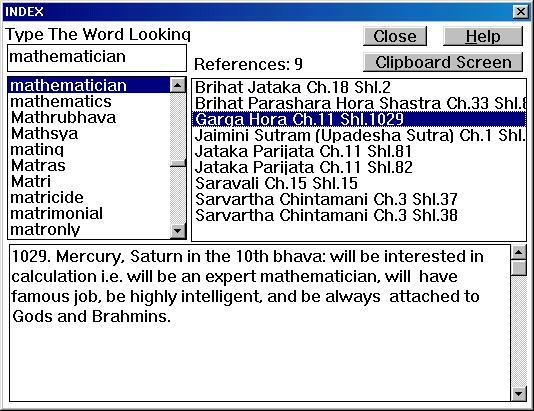 GeoVision Software Inc. proudly presents an invaluable tool for studying Vedic Astrology – The Vedic Astrology Bookshelf software. The Vedic Astrology Bookshelf program contains complete text of 16 highly regarded classical Vedic Astrology vloumes. This Unique software will enable you to tap into the precious resource of the authentic Vedic Astrology knowledge through use of modern technology. The timeless wisdom of the ancient Rishis will guide you in your studies. The Vedic Astrology Bookshelf will calculate a Jyotish horoscope chart and subsequently (Yogas) applicable to the chart,producing anywhere from 600 to 800 text references from the classics. That’s right, 40-50 pages of material uniquely pertaining to your chart. It is like printing a correspondence cource using your own chart as the case study. Having a hard time finding specific information in the classics? Welcome to the computerized Jyotish library – the Vedic Astrology Bookshelf software in which you can effortlessly lookup references in no time. We are confident that you will appreciate the reliability, speed and convenience of the program that will do all the tedious search work for you. You simply type any word and the program instantly displays all the places in all the 16 volumes where this word appears. You can also search for a string or combination of words. Now you can effortlessly accumulate information about any aspect of Vedic Astrology through the use of The Vedic Astrology Bookshelf! There has never been a better way to study or research the fundamentals of Vedic Astrology! The Yogas Screen presents a vast and impressive list of Yogas and quotes that apply to a particualr chart. This feature alone produces between 600-800 Yogas and quotes from the classics, which amounts to approximately 45 pages of material uniquely pertaining to your chart. An extraordianry amount of invaluable information! 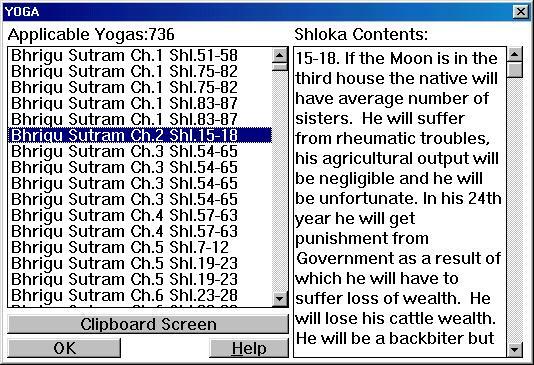 The combinations are displayed in a list, indicating the title of the book, the chapter in which it appears, and the Shloka (verse) number. Click on any reference, and the actual contents of the verse will appear on the screen. Of course you can also pring the collection of quotes that you find. The printout is beautifully formatted, listing the source(book/chapter/shloka) for each reference. You can choose to print either all of the found quotes or just the ones containing positive interpretations or even make a specific selection of quotes you want to print. The possibilities are endless! The Index Screen is a great tool for searching for a single specific word. Select any word from the list and a list of references will display all the places in each of results of the 16 classical texts in which that word accours. The results of your search appear as a list of references on the screen and can be individually viewed by selecting the reference in the list. The text will be displayed at the botttom of the screen. You can also read the references in their original context by double clicking on the selection. The Clipboard Screen allows you to tie together all the other search features and create fully customized reports, perfect for studying, research and teaching purposes. 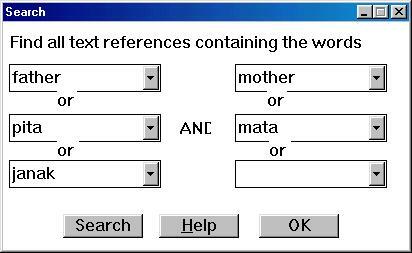 The Search Screen allows the user to search for a combination of words. For example, to search for references pertaining to the health of your parents you could enter “father” or “mother” or “parents” AND “happiness” or “luck” or “affluence”. The program will begin searching for references within each of the 16 classical texts containing a combination of these words. Once the software completes the search, it will display all of the found references on the program’s “Clipboard”. The software will automatically retain the words used in the last four searches, making it both convenient and efficient. The Vedic Astrology Bookshelf allows you to read the classical Vedic Astrology texts in the same manner as reading any paper book. 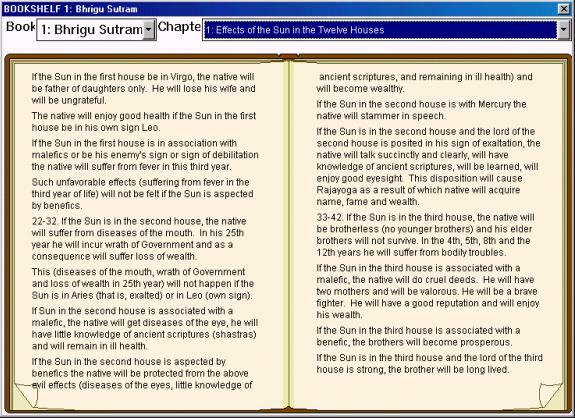 The book Screen tool contains the essence of The Vedic Astrology Bookshelf – the actual classical texts. You can select any of the 16 texts from the menu and read the volume page-to-page, chapter-to-chapter. While reading the text, which appears in a beautifully formatted “open book” graphic, you can turn a page in either direction, and even switch between the chapters. The entire text of all the 16 classics is within your reach. Please fill out the form to view the personalized content.